A memorial service and vigils were organized. The Mayor of Charlottesville, the Virginia Secretary of Public Safety, the Attorney General and the FBI director called the attack domestic terrorism. Rally participants are preparing to enter Emancipation Park in Charlottesville, Virginia on August 12, 2017. They carry Confederate battle flags, Gadsden flags, and a Nazi flag. The Unite the Right rally was a white supremacist rally that occurred in Charlottesville, Virginia from August 11 to 12, 2017. Jason Kessler, the organizer of the rally, had been protesting for months the proposed removal of a statue of Robert E. Lee in Emancipation Park in Charlottesville. Individuals and groups of different beliefs and tactics demonstrated against the rally. Many counter-protesters were ready to turn out despite the threat of violence. Protesters and some militant counterprotesters were attacking each other. On August 12, 2017, a maroon minivan and a white Toyota Camry sedan behind it were driving down the Fourth Street Southeast crossing (after a sawhorse barricade blocking southward traffic left behind by an evacuating officer was moved) of the Downtown Mall toward Water Street and were stopped by a large group of counter-protesters who decided to walk up Fourth Street Southeast in the direction of Market Street. A school resource officer stationed at the intersection of 4th Street NE and Market Street was reassigned after she radioed for assistance when "violent skirmishes" broke out causing her to feel unsafe. However, the officer was not replaced and the intersection was left without a police presence. According to the report, "unknown persons" moved a sawhorse barricade set up to block traffic from moving down 4th Street. A gray 2010 Dodge Challenger drove down Fourth Street Southeast mall crossing and idled for a short time behind the white Toyota at the Downtown Mall. It then backed up and traveled more than a block before rapidly accelerating forward. A 2010 Dodge Challenger, similar to the vehicle involved. This image has stock rims while the car involved in the attack had aftermarket black rims. At around 1:45 p.m. on August 12, 2017, the 2010 Dodge Challenger impacted a crowd of counter-protesters while driving at a high speed. The speed was estimated between 23-28 mph (37-45 km/h) by a police crash reconstructionist. It audibly rammed pedestrians and struck the white sedan. The impact accelerated the sedan to 17.1 mph (27.5 km/h). The impact reportedly "[shoved] tons of metal into the crowd" and sent people "flying through the air" and over another car near the intersection with Water Street East. The struck vehicle also hit the maroon minivan ahead, "sending that vehicle into more pedestrians". A few seconds after the initial impact, Fields drove in reverse—hitting more people—with his car's front bumper "scraping the road". Pedestrians who had avoided the attack chased Fields along Fourth Street. Fields backed up at a high speed for several blocks, and then turned left and sped off down Market Street. A Virginia State Police Bell 407 helicopter, that crashed about three hours later, was following the car and relaying its route to ground units. A deputy stopped and arrested Fields on Monticello Avenue, about a mile from the attack. The deputy waited for the police to arrive, and detective Steven Young came from the police department. According to Young, Fields kept apologizing and asked if anyone was injured. When Young told him that a person had died, Fields appeared shocked and started to cry. Young said that the Dodge had holes in the rear window—made by counter-protesters after the initial impact—and heavy front-end damage; Young said that the car was "splattered" with blood and flesh. A pair of blue sunglasses was stuck in the spoiler on the car's trunk. Heather Heyer, a 32-year-old woman, was fatally injured in the attack, and died at the University of Virginia Medical Center. Initially, nineteen injuries were reported, as twenty patients were taken at the University of Virginia Medical Center. In the evening, five people were in critical condition and fourteen others were being treated for lesser injuries. Nine people had been discharged and ten remained hospitalized in good condition the next day. Testimony at the preliminary hearing in December 2017 revealed that a total of 35 people were injured. The organizer of the Unite the Right rally, Jason Kessler, held a news conference near the Charlottesville City Hall the day after the car attack. A crowd of around a hundred counter-protesters shouted him down, screaming "murderer". A few protesters then broke through the line of reporters and headed toward Kessler. The police brought Kessler into the City Hall after a counter-protester made an obscene gesture and another counter-protester lunged at him. Twenty minutes later, the police formed a line and Kessler ran out of a door at the side of the building and lunged into the back of a marked police SUV. As the SUV sped away, a single counter-protester chased it, yelling, "Shame! Shame! Shame!" In February 2018, three were found guilty of assaulting Kessler at the news conference and a case against a person charged with spitting on Kessler was continued until February 2019 at the request of the prosecution. James Alex Fields Jr. (born April 26, 1997) was the driver of the car. Fields grew up with his mother Samantha Bloom, a paraplegic, in Florence, Kentucky. After living in southwest Florence for ten years, they moved to Monclova Township, Lucas County, Ohio for her job in late 2016. Fields' mother told the Toledo Blade that he had "recently moved out on his own". Until his arrest in Charlottesville, Fields worked for about two years as a security guard in Ohio; he earned US$10.50 per hour and his income was $650 every two weeks. According to acquaintances, Fields "filled his time" playing video games and working at a local grocery store. According to Fields' high school history teacher, Derek Weimer, Fields was prescribed an antipsychotic as anger management medication after he had been diagnosed with schizophrenia. Fields told a judge that he was receiving treatment for bipolar disorder, anxiety, depression and attention deficit hyperactivity disorder (ADHD). Fields' father was killed in a car crash on December 5, 1996, five months before he was born. Bloom's parents died in a murder-suicide when she was 16 on August 21, 1984 when Bloom's father, 42-year-old self-employed contractor Marvin, killed his 37-year-old ex-wife Judy and himself. Fields threatened his mother with violence on multiple occasions. In November 2010, she locked herself in a bathroom, afraid of her son. Fields's mother reported to the police that he had threatened to beat her, took her phone, struck her head, and put his hands over her mouth after she told him to stop playing video games. In February 2011, Fields's mother reported to the police at 5:20 a.m. that he had not come home; she said that he was wearing a T-shirt and shorts. Two hours later, she reported to the police that Fields "was home and acting lethargic"; he threatened to run away "if police came to the condo." In October 2011, Fields threatened her with a 12-inch (30 cm) knife; she called the police the next day to say that her son had been "very threatening" toward her and that she was scared and did not feel in control of the situation because she was in a wheelchair. In November 2011, Fields spat in his mother's face and threatened her, and a woman requested that the police help Fields's mother get him to a hospital for assessment; the log for the call reads, "Mom is scared he is going to become violent here." Fields was subsequently arrested and held in juvenile detention. When he was a senior in high school, Fields applied to join the Army, and Derek Weimer, Fields's history teacher and a former Ohio National Guard officer, helped him because Weimer believed that the military "would expose Fields to people of different races and backgrounds and help him dispel his white supremacist views." Fields was turned down, which Weimer called a "big blow." Fields entered the Army on August 18, 2015 and was released from active duty "due to a failure to meet training standards" on December 11, the same year. Army spokeswoman Lt. Col. Jennifer Johnson said that Fields "was never awarded a military occupational skill nor was he assigned to a unit outside of basic training". Weimer lost contact with Fields after he had graduated, and was "surprised" when he heard that Fields had managed to enlist in the Army. Fields graduated from Randall K. Cooper High School in 2015. Fields purchased his first car, the 2010 Dodge Challenger used in the attack, from a car dealership in Florence, Kentucky in June 2015. The car was last registered in Ohio, and Fields updated its title in Maumee, Ohio in July 2015. The Cincinnati Enquirer reported that, according to local court records, he was cited for expired or unlawful license plates by the Maumee police in May 2017. An ex-schoolmate of Fields said that Fields would draw swastikas and talk about "loving Hitler" as early as middle school. Fields' high school history teacher said that Fields was "deeply into Adolf Hitler and white supremacy". The teacher, Derek Weimer, reportedly taught Fields in three classes at Randall K. Cooper High School and "had regular interaction with him after classes and during free time". He told The Cincinnati Enquirer, "I'm sure if you would ask James he would say I was his favorite or one of his favorite teachers." Weimer said that Fields was "a very bright kid but very misguided and disillusioned". Weimer said, "Once you talked to James for a while, you would start to see that sympathy towards Nazism, that idolization of Hitler, that belief in white supremacy. It would start to creep out." Weimer said that he had done his best to steer Fields away from those interests and had thought that he had succeeded in doing so. He said that he felt like he failed as a teacher because of the attack, but that "this is definitely a teachable moment and something we need to be vigilant about, because this stuff is tearing up our country". Weimer said that another teacher had filed a report during Fields' freshman year because he had written something that was "very much along the party lines of the neo-Nazi movement". He said that it "would have been standard procedure" to notify Fields' mother and that the school administrators "were very good about keeping parents in the loop". According to Weimer, Fields "left school for a while" and became quieter about politics when he came back, until his senior year, when the candidates for the 2016 presidential election were declared. Weimer said that Fields supported Donald Trump because of what he perceived were Trump's racial views. According to Weimer, Fields supported Trump's Mexico border proposal. Weimer said that Fields "admired" the Confederate States of America for their military, though they "never spoke about slavery". Weimer said that "the constant presence of the Confederate flag was an ongoing issue" and that an African-American cheerleader was "very uncomfortable having to ride in a parade being carried by a pickup truck with a large Confederate flag sticker". Fields reportedly made students feel "unnerved" and "unsafe", and one woman told The New York Times, "On many occasions there were times he would scream obscenities, whether it be about Hitler or racial slurs." Fields' roommate on a class trip to Europe in 2015 told the Associated Press that Fields went on the trip only to visit Germany, and referred to it as the Fatherland. He couldn't handle being in a room with Fields after Fields spoke about French people "being lower than us and inferior to us". Fields voted in the March 15, 2016 Ohio Republican primary. A lot of boys get interested in the Germans and Nazis because they're interested in World War II. But James took it to another level. He researched everything and had an intellectual argument for all his points, which is something you just don't see that often. Fields' mother said that he had a pet cat, and that she was taking care of it during the rally. She did not know that her son was attending a white supremacist rally; instead, she thought that he was attending a Donald Trump-related rally. She told him "to be careful, and if they're going to rally to make sure he's doing it peacefully". She said that she "would be surprised if her son's views were so far right that he would attend a white supremacist rally" and that he had an African-American friend. She told the Toledo Blade that she had not spoken with her son about his political views. Fields' Facebook page included memes and symbols associated with the far-right. At the Unite the Right rally, the morning of the attack, Fields was seen wielding a Vanguard America shield. Vanguard America, a neo-Nazi organization, stated that it was not associated with Fields. There is no evidence that Fields was affiliated with any of the groups assembled that day. Fields was initially charged with one count of second-degree murder, three counts of malicious wounding, and one count of hit and run. Fields appeared in court on August 14, via video from jail, and was denied bail. Fields said that he could not afford a lawyer; a private attorney was appointed by the judge, as a public defender could not be appointed due to a conflict of interest. By August 17 he was represented by Denise Y. Lunsford, replacing Charles L. Weber. The next hearing for Fields was set for August 25. On August 12, the Justice Department announced a joint civil rights investigation into the incident conducted by the Justice Department's Civil Rights Division, the Federal Bureau of Investigation and the U.S. Attorney for the Western District of Virginia. NPR's Carrie Johnson reported that investigators wanted to know whether Fields had crossed state lines with the intent to commit violence. A Department of Justice official said that they would "investigate whether others may have been involved in planning the attack". Lisa Monaco, Homeland Security Advisor to President Barack Obama, raised the question of whether the attack would be investigated as domestic terrorism. Attorney General Jeff Sessions said on Good Morning America on August 14 that the attack met the definition of domestic terrorism. Attorney General Jeff Sessions said that civil rights division FBI agents and FBI terrorism investigators were working on the case. FBI Director Christopher A. Wray said that the attack met the definition of domestic terrorism. You can be sure we will charge and advance the investigation towards the most serious charges that can be brought because this is unequivocally an unacceptable, evil attack. On August 19, Fields was charged with two additional counts of malicious wounding, and three counts of aggravated malicious wounding. Charlottesville Police Lieutenant Steve Upman said in a release, "The victims related to these charges suffered serious injuries and in some cases permanent physical disabilities." The investigation remained under the Charlottesville police, the FBI and the DOJ. It was also reported on August 19 that the FBI had been attempting to identify individuals who were near Fields a few minutes before the attack, and that the city police had stated multiple times that Fourth Street Southeast had not been "supposed to be open at that time" and that they were "still investigating how the street was opened and why vehicles were directed toward it". At the preliminary hearing in December 2017, State District Court Judge Robert H. Downer Jr. certified all ten charges to a grand jury. The certified charges were one count of first-degree murder, three counts of malicious wounding, three counts of aggravated malicious wounding, two counts of felonious assault and one count of hit and run. Video footage of the surveying helicopter and surveillance video footage from a restaurant near the mall crossing were shown. Surveillance video footage from the restaurant reportedly showed the Dodge Challenger zooming past "a string of vehicles" heading south on Fourth Street Southeast. On January 3, 2018, Fields waived his right to a speedy trial, and his trial was scheduled to begin on November 26, 2018, and last three weeks. On December 7, Fields was found guilty of first-degree murder, hit and run, and eight counts of malicious wounding. On December 11, the jury recommended life in prison for the killing of Heather Heyer along with an additional 419 years for the other crimes committed which break down to 70 years for each of five malicious wounding charges, 20 for each of three malicious wounding charges, and nine years on one charge of leaving the scene of an accident. As investigations were launched into the attack, a Department of Justice official said that federal hate crime charges could be applied to the case. Attorney General Jeff Sessions said of the indictment, "Last summer's violence in Charlottesville cut short a promising young life and shocked the nation. Today's indictment should send a clear message to every would-be criminal in America that we aggressively prosecute violent crimes of hate that threaten the core principles of our nation." W.D. Va. Attorney Thomas T. Cullen called the indictment "the culmination of a 10-month investigation that involved searching the social media accounts where Mr. Fields showed an interest in harming minorities". Adam S. Lee, the special agent in charge of the FBI's Richmond Division, said, "Heyer did not go to the event looking for a fight. She was looking to lend her voice to her cause. Peaceful protest without intimidation, without the threat of violence is every American's birthright." On July 5, 2018, Fields pleaded not guilty to all 30 counts of federal hate crime charges. On March 27, 2019, Fields altered his plea. Having originally pleaded not guilty on all charges, this was changed to guilty on 29 of 30 Hate Crime charges. Is speculated that this was a plea bargain to avoid the possibility of the Death Penalty as the option of capital punishment was removed from his potential sentence as a result of the alteration. Heather Danielle Heyer (May 29, 1985 – August 12, 2017) was the only person killed in the attack. Heyer grew up in Ruckersville, Virginia, and graduated from William Monroe High School in Stanardsville, Virginia. She worked as a bartender and waitress. She was approached by Alfred A. Wilson, the manager of the bankruptcy division at the Miller Law Group in Charlottesville. Heyer did not have a background in law; Wilson hired her at the recommendation of a friend and said that she "had an eye for detail" and was "a people person". He reportedly told her, "If you can get people to open up to you, that's what I need. I'll teach you everything about the law you need to know." She continued her job as a waitress while working at the law firm. Wilson said that Heyer did not take any vacations during her first two years at Miller Law Group. Heyer left her boyfriend after he made a racist comment about Wilson, an African-American. Heyer lived alone. Her friends described her "as a passionate advocate for the disenfranchised who was often moved to tears by the world's injustices", and said that she "spoke out against inequality and urged co-workers to be active in their community". According to Heyer's mother Susan Bro, Heyer would ask people of opposing views why they had come to their beliefs. Bro said that she and Heyer advocated for Black Lives Matter, which Bro said fights for equal treatment. I've never had a close friend like this be murdered. We thought, "What would Heather do?" Heather would go harder. So that's what we're going to do. We're going to preach love. We're going to preach equality, and Heather's death won't be in vain. A memorial service was held at the Paramount Theater, two blocks from the attack location, on August 16. More than a thousand people attended the service, many of them wearing sashes and ribbons. Present were Governor Terry McAuliffe (D-VA), junior Senator Tim Kaine (D-VA), gubernatorial candidate Lt. Gov. Ralph Northam (D-VA) and gubernatorial candidate and former Counselor to the President Ed Gillespie (R-VA). Heyer's mother Susan Bro delivered a speech calling for people to fight "as Heather would do". A standing ovation lasted nearly a minute and a half after Bro said, "They tried to kill my child to shut her up, but guess what, you just magnified her." Bro said that she had received hundreds of messages from people inspired by Heyer asking for advice. A woman played "Amazing Grace" and "America the Beautiful" on a saxophone. Heyer's father Mark Heyer said that Heather had been "defiant, strong-willed and compassionate" and that she "always argued for what she thought was right". Several people with purple shields, pink bats and pink helmets with a heart drawn on each were observing outside the theater to stop any "fascist groups" that might disrupt the event. No problems were reported outside the theater. As the service ended, Bro asked someone in the audience to stop criticizing President Trump. Senator Tim Kaine of Virginia visits a makeshift memorial to Heather Heyer at the site of the attack. Politicians were confronted outside the memorial service. After being asked about it, McAuliffe told a man that Virginia law leaves the removal of Confederate statues to local communities. Kaine was asked why the Charlottesville police "had failed to head off the weekend's violent clashes" and he "said [that] city officials had promised an independent review of the police response". A vigil in remembrance of Heyer was planned for August 13 night, but was cancelled due to a "credible threat from white supremacists". People gathered and prayed at the site of the attack in spite of the cancellation. Hundreds of people gathered at the University of Virginia and in other U.S. cities, including Philadelphia and Akron, Ohio. Michael Wilson, Principal of the Randall K. Cooper High School that Fields had attended, said: "As educators, we are always using teachable moments and providing guidance to students to create college, career and life ready students to make good and sound choices. [...] We're all educators and we all are reflecting on what did we miss, or what could we do better. We do that with any student who may have made a wrong choice." He said that his staff sent thoughts and prayers to Charlottesville. Wilson said that the faculty members were worried about the victims and concerned about Fields. And there are others like him out there – we as a society have to do a better job of figuring out how to reach them. This isn't something that happens overnight ... it builds up over time and we need to pay more attention to this. Principal Wilson called Fields a "quiet and reserved student". Fields was described as "shy" and "quiet" by his ex-classmates and neighbors. A woman who went to school with Fields told The New York Times that he "mostly kept to himself" and "didn't start fights or try to fight", but described him as "exceptionally odd and an outcast to be sure". However, Fields' roommate on a class trip to Europe in 2015 told the Associated Press, "He had friends, he had people who would chat with him, it wasn't like he was an outcast." Boone County Schools spokeswoman Barbara Brady said that school officials "were not aware of any situation at Cooper High regarding Fields' behavior at the time of his enrollment". Brady questioned the trustworthiness of reports by Fields' ex-classmates, criticizing them for not reporting incidents. This is something I'm guilty of, too, I kind of brushed it off as just creepy. We thought it was all talk. No one ever thought he would do something so violent. The city of Charlottesville and its City Council published a statement: "This senseless act of violence rips a hole in our collective hearts. While it will never make up for the loss of a member of our community, we will pursue charges against the driver of the vehicle that caused her death and are confident justice will prevail." Mayor Michael Signer called the attack domestic terrorism and blamed white supremacists. In a statement on August 18, Mayor Michael Signer called on the City Council to "take concrete steps to memorialize Heather's name and legacy." Signer asked the governor to convene an emergency General Assembly session to allow Charlottesville to remove the statue of Robert E. Lee. Brian Moran, the Virginia Secretary of Public Safety, said, "He was a terrorist to do what he did." Attorney General Jeff Sessions said in a statement, "The violence and deaths in Charlottesville strike at the heart of American law and justice. When such actions arise from racial bigotry and hatred, they betray our core values and cannot be tolerated. Justice will prevail." On August 17, White House Deputy Press Secretary Lindsay Walters said that Trump would meet with Heyer's family. U.S. President Donald Trump praised Heyer as "an incredible young woman". Heyer's mother Susan Bro thanked Trump for his August 14 remarks on the event. She wrote in a statement: "Thank you, President Trump, for those words of comfort and for denouncing those who promote violence and hatred. My condolences, also, to the grieving families of the two state troopers and quick recovery for those injured." I thought that the statement put out, the mother's statement, I thought was a beautiful statement. I'll tell you, it was something that I really appreciated. I thought it was terrific. And really, under the kind of stress that she's under, and the heartache she's under, I thought putting out that statement to me was really something I won't forget. Thank you all very much. Thank you. Bro initially declined to respond to Trump's August 15 statement as she was busy and tired. After Bro saw Trump's August 15 statement, she said that she would not talk to Trump. Trump tweeted about the memorial service the morning of the day that it occurred. No Trump administration officials were present at the service. Jason Kessler, the organizer of the Unite the Right rally, said that none of the organizers knew Fields. After being unable to hold a press conference due to violence, he accused the city of "shutting down" speech and said that the city officials "failed to separate the protest groups and were ill-equipped to handle the melee that resulted". White supremacist rally speaker Richard B. Spencer placed the blame for the attack on authorities, who "failed to keep order". Spencer refused to condemn Fields, saying, "This man could have lost control because he felt in danger and slammed on the accelerator and unintentionally killed someone." On August 18, 2017, Kessler wrote on Twitter: "Heather Heyer was a fat, disgusting Communist. Communists have killed 94 million. Looks like it was payback time." Kessler deleted the tweet the next day, initially saying he was hacked, but later claiming he had been on a mixture of drugs. Other white nationalists criticized Kessler for the tweet, including Richard Spencer, who wrote: "I will no longer associate w/ Jason Kessler; no one should. Heyer's death was deeply saddening. 'Payback' is a morally reprehensible idea." Heyer's mother Susan Bro said that she did not want people to hate Fields. She said that it was not what her daughter would have wanted. Heyer's father Mark said that "people on all sides need to learn to forgive each other". On the last day of his job, photojournalist Ryan Kelly took a photograph of the attack for The Daily Progress, the sole daily newspaper in the vicinity of Charlottesville. On April 16, 2018, Kelly won the Pulitzer Prize for Breaking News Photography. Photographer Jeremiah Knupp also took a photograph of the attack, working for The News Leader, a daily newspaper serving Staunton, Virginia and the surrounding areas. Knupp took the photograph from a pole on the parking garage, south-west of the intersection of Water Street and Fourth Street Southeast. A GoFundMe campaign created to support Heyer's family had surpassed US$200,000 in a day. Fundraising websites removed campaigns that had sought to fund Fields' legal defense. The Democratic Socialists of America quickly raised US$198,000, but were criticized for the convoluted application process for victims and timeliness in addressing their applications. The money raised was eventually transferred to the National Compassion Fund for management and disbursement. Heyer's mother Susan Bro started the nonprofit Heather Heyer Foundation. It was funded from the GoFundMe campaign and from new donations. Bro said that the foundation would be devoted to civil rights and provide scholarships to people who want social justice. She quit her job as a secretary and bookkeeper for a Virginia Cooperative Extension office after the attack, and became the president and chair of the board of the Heather Heyer Foundation. On August 15, 2017, Tadrint and Micah Washington, who were in the white sedan that was hit during the attack, filed a US$3 million lawsuit in damages against Jason Kessler, James Alex Fields Jr., Richard Spencer and 30 other groups and individuals. Susan Bro presented the 2017 MTV Video Music Award for Best Fight Against the System. In September 2017, New York's 25th Assembly district Representative Nily Rozic, a Democrat, filed a bill and petitioned the New York State Office of Parks, Recreation and Historic Preservation to rename the Donald J. Trump State Park in honor of Heyer. On December 20, 2017, a part of Fourth Street Southeast in Charlottesville, where the attack occurred, was designated Honorary Heather Heyer Way. On the afternoon of May 12, 2018, Heyer's close friend Marissa Blair married her fiancé Marcus Martin, who pushed her out of the car's way and was injured in the attack himself. During the ceremony, Blair led a butterfly release in remembrance of Heyer. The 2018 film BlacKkKlansman features video footage of the attack; the film ends with a dedication to Heyer. ^ a b Astor, Maggie. "A Guide to the Charlottesville Aftermath". The New York Times. Archived from the original on August 14, 2017. Retrieved May 24, 2018. ^ a b Bromwich, Jonah; Blinder, Alan (August 13, 2017). "What We Know About James Alex Fields Jr., Driver Charged in Charlottesville Killing". The New York Times. Archived from the original on August 13, 2017. Retrieved May 24, 2018. ^ a b Heim, Joe; Silverman, Ellie; Shapiro, T. Rees; Brown, Emma (August 13, 2017). "One dead as car strikes crowds amid protests of white nationalist gathering in Charlottesville; two police die in helicopter crash". The Washington Post. Retrieved May 24, 2018. ^ Tucker Paulsen, Stephen (July 26, 2018). "Charlottesville rally victim from Houston has no regrets for protesting white supremacists". HoustonChronicle.com. Retrieved September 29, 2018. ^ a b c d e f g h i j k l m n o p q r s t u v w x "Charlottesville Car Attack: Who Is Accused Suspect James Alex Fields Jr.? : The Two-Way". NPR. Archived from the original on August 17, 2017. Retrieved May 24, 2018. ^ a b c d e f g h i j Blinder, Alan (August 13, 2017). "Suspect in Charlottesville Attack Had Displayed Troubling Behavior". The New York Times. Retrieved May 24, 2018. ^ a b c d e f g h i j k l m n Pilcher, James (August 14, 2017). "Charlottesville suspect's beliefs were 'along the party lines of the neo-Nazi movement,' ex-teacher says". The Cincinnati Enquirer. Retrieved May 26, 2018. ^ a b c d e f g h Pilcher, James (August 14, 2017). "Charlottesville suspect's beliefs were 'along the party lines of the neo-Nazi movement,' ex-teacher says". USA Today. Retrieved May 26, 2018. ^ a b c d e f g h i j k l m n o p Strickley, Bob; Brookbank, Sarah; Graves, Chris; Mayhew, Chris (August 15, 2017). "911 calls, records reveal tumultuous past for accused Charlottesville driver, family". The Cincinnati Enquirer. Retrieved May 27, 2018. ^ a b c d Toy, Sarah; Bacon, John (August 14, 2017). "No bail for Charlottesville car attack suspect James Fields". USA Today. Retrieved May 27, 2018. ^ a b c d e f g h i j k l m n o Berg, Lauren (December 14, 2017). "Charge against Fields upgraded to first-degree murder". The Daily Progress. Archived from the original on January 6, 2018. Retrieved May 25, 2018. ^ a b c d "Ohio Man Charged with Federal Hate Crimes Related to August 2017 Rally in Charlottesville". United States Department of Justice Office of Public Affairs PR. June 27, 2018. Retrieved August 1, 2018. ^ Stanglin, Doug (August 12, 2017). "1 dead, 19 injured as car hits crowd after a 'Unite the Right' rally in Charlottesville; driver in custody". USA Today. Retrieved December 13, 2018. ^ Binkowski, Brooke (August 12, 2017). "Driver in Charlottesville Car Attack Identified as James Alex Fields, Jr". Snopes News. Retrieved December 13, 2018. ^ Romo, Vanessa (December 7, 2018). "Charlottesville Jury Convicts 'Unite The Right' Protester Who Killed Woman". NPR. Retrieved December 8, 2018. ^ a b Duggan, Paul; Jouvenal, Justin (March 27, 2019). "Neo-Nazi sympathizer pleads guilty to federal hate crimes for plowing car into crowd of protesters at 'Unite the Right' rally in Charlottesville". The Washington Post. Retrieved March 27, 2019. ^ a b c Fausset, Richard; Feuer, Alan (August 13, 2017). "Far-Right Groups Surge Into National View In Charlottesville". The New York Times. Archived from the original on August 16, 2017. Retrieved May 24, 2018. ^ "One killed in US far-right rally violence". BBC News. August 13, 2017. Retrieved May 24, 2018. ^ Stockman, Farah (August 14, 2017). "Who Were the Counterprotesters in Charlottesville?". The New York Times. Retrieved May 24, 2018. 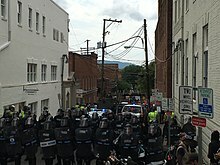 ^ https://www.bustle.com/p/14-mistakes-charlottesville-police-made-during-the-white-nationalist-rally-according-to-a-new-report-6764301 "A school resource officer stationed at the intersection of 4th Street NE and Market Street was reassigned after she radioed for assistance when "violent skirmishes" broke out causing her to feel unsafe. However, the officer was not replaced and the intersection was left without a police presence. According to the report, "unknown persons" moved a sawhorse barricade set up to block traffic from moving down 4th Street"
^ a b c d e f g Duggan, Paul (December 14, 2017). "Charge upgraded to first-degree murder for driver accused of ramming Charlottesville crowd". The Washington Post. Retrieved May 24, 2018. ^ Shulleeta, Brandon (August 12, 2018). "At least one dead as white nationalists ignite Virginia clashes". Reuters. Retrieved May 24, 2018. ^ https://www.richmond.com/news/virginia/two-people-who-were-with-fields-moments-before-fatal-crash/article_773d864d-2ff2-5d8a-a0e2-dc4529496deb.html "Clifford Thomas, a senior trooper and Virginia crash reconstructionist, testified Wednesday that Fields’ vehicle reached a top speed of 28 mph before he hit a silver Toyota Camry that was in the middle of the crowd. He said he was not able to determine what speed the car was going when it struck the crowd, but it appeared to be traveling at 23 mph upon impact with the Camry." ^ https://www.cbs19news.com/content/news/James-Fields-Charlottesville-trial-compilation-501014372.html "Thomas testified data from Washington's car showed the impact of the crash caused it to be pushed from zero miles per hour to 17.1 miles per hour"
^ a b c d e f g Shapiro, T. Rees; Crites, Alice; Vozzella, Laura; Cox, John Woodrow (August 13, 2017). "Alleged driver of car that plowed into Charlottesville crowd was a Nazi sympathizer, former teacher says". The Washington Post. Retrieved July 27, 2018. ^ a b c d e f g Balmert, Jessie; Strickley, Bob; Stanglin, Doug; Cavallaro, Gabe (August 15, 2017). "Ohio man charged in Charlottesville vehicle attack grew up in NKY". The Cincinnati Enquirer. Retrieved May 27, 2018. ^ a b c d e f Spencer, Hawes; Pérez-Peña, Richard (December 14, 2017). "Murder Charge Increases in Charlottesville Protest Death". The New York Times. Retrieved May 24, 2018. ^ Stockman, Farah (November 29, 2018). "The Charlottesville Murder Trial Is Beginning. Here's What to Know". The New York Times. Retrieved November 29, 2018. ^ Hartung, Kaylee; Simon, Darran (December 15, 2017). "Suspect in Charlottesville car attack faces first-degree murder charge". CNN. Retrieved July 30, 2018. ^ a b c d e f g h i j k l m n Caron, Christina (August 13, 2017). "Heather Heyer, Charlottesville Victim, Is Recalled as 'a Strong Woman'". The New York Times. Retrieved May 24, 2018. ^ a b c d e f Bacon, John; King, Robert; Toy, Sarah (August 14, 2017). "Vigil for Charlottesville victim canceled, but mourners meet at crash site". USA Today. Retrieved July 11, 2018. ^ a b c d e f g Silverman, Ellie; Laris, Michael (August 13, 2017). "Charlottesville victim: 'She was there standing up for what was right'". The Washington Post. Retrieved July 16, 2018. ^ Berg, Lauren (February 2, 2018). "Three found guilty of assaulting Kessler at Aug. 13 press conference". The Daily Progress. Retrieved August 1, 2018. ^ a b c d e f g h i j Hernández, Arelis R.; Gillum, Jack; Miller, Michael E.; Hendrix, Steve (August 14, 2017). "'Very threatening': Mother of Charlottesville suspect James A. Fields called 911 twice". The Washington Post. Retrieved May 26, 2018. ^ a b c d Pilcher, James; Graves, Chris (August 13, 2017). "Ex-neighbor of James Alex Fields Jr.: 'Hope they put him where the sun doesn't shine'". The Cincinnati Enquirer. Retrieved May 26, 2018. ^ a b Sparling, Hannah; Balmert, Jessie; Stinchcomb, Jon (August 14, 2017). "Community: Accused Charlottesville driver James Alex Fields Jr. doesn't represent us". The Cincinnati Enquirer. Retrieved May 27, 2018. ^ a b c d Heim, Joe; Barrett, Devlin (June 27, 2018). "Man accused of driving into crowd at 'Unite the Right' rally charged with federal hate crimes". The Washington Post. Retrieved June 27, 2018. ^ a b "James Alex Fields' trial in deadly Charlottesville white nationalist rally set to begin". Associated Press. November 26, 2018. Retrieved November 27, 2018. ^ Kang, Dake; Rankin, Sarah (August 16, 2017). "Charlottesville driver previously accused of beating mother". AP News. Retrieved August 9, 2018. ^ Stolberg, Sheryl Gay; Rosenthal, Brian M. (August 12, 2017). "Man Charged After White Nationalist Rally in Charlottesville Ends in Deadly Violence". The New York Times. Retrieved July 9, 2018. ^ a b Savage, Charlie (August 13, 2017). "A Hate Crime? 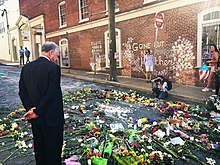 How the Charlottesville Car Attack May Become a Federal Case". The New York Times. Retrieved May 24, 2018. ^ a b "Fields faces 5 additional felony charges related to Aug. 12 fatal crash". The Daily Progress. August 18, 2017. Archived from the original on August 19, 2017. Retrieved May 24, 2018. ^ Seal, Dean (August 19, 2017). "FBI tries to ID people spotted with Fields". The Daily Progress. Retrieved January 13, 2019. ^ "Fields set for three-week trial in November". The Daily Progress. January 3, 2018. Retrieved August 1, 2018. ^ "James Fields guilty of murdering Heather Heyer in Charlottesville". WTVR.com. December 7, 2018. Retrieved December 7, 2018. ^ "The Latest: Slain woman's mom 'content' with life sentence". The Associated Press. Retrieved December 11, 2018. ^ Benner, Katie; Spencer, Hawes (June 27, 2018). "Charlottesville Car Attack Suspect Indicted on Federal Hate Crime Charges". The New York Times. Retrieved August 1, 2018. ^ Strickley, Bob (July 6, 2018). "NKY native James Alex Fields pleads not guilty in Charlottesville attack". The Cincinnati Enquirer. Retrieved July 27, 2018. ^ a b c "Heather Heyer Memorial". Paramount Theater. ^ Porter, Tom (October 17, 2017). "Anti-racism activist Heather Heyer's cause of death has been revealed in a medical report". Newsweek. Retrieved May 24, 2018. ^ a b c d e f g h i j k l Silverman, Ellie; Hernández, Arelis R.; Hendrix, Steve (August 16, 2017). "'They tried to kill my child to shut her up,' Heather Heyer's mother mourns at funeral for woman killed during Nazi protest in Charlottesville". The Washington Post. Retrieved July 9, 2018. ^ a b c d e Bromwich, Jonah Engel (August 18, 2017). "Mother of Woman Killed in Charlottesville Says She Will Not Speak to Trump". The New York Times. Retrieved July 9, 2018. ^ Horton, Alex (August 16, 2017). "What it looks like in Charlottesville, site of a massive vigil and march". The Washington Post. Retrieved July 11, 2018. ^ "A Statement of Condolence from the City of Charlottesville and City Council". The City of Charlottesville, Virginia. August 16, 2017. Retrieved October 1, 2018. ^ a b c Faulders, Katherine; Mallin, Alexander; Kelsey, Adam (August 18, 2017). "White House: Trump finding 'convenient' time to speak with Heyer's family". ABC News. Retrieved July 9, 2018. ^ Donald J. Trump [@realDonaldTrump] (August 13, 2017). "Condolences to the family of the young woman killed today, and best regards to all of those injured, in Charlottesville, Virginia. So sad!" (Tweet) – via Twitter. ^ Donald J. Trump [@realDonaldTrump] (August 16, 2017). "Memorial service today for beautiful and incredible Heather Heyer, a truly special young woman. She will be long remembered by all!" (Tweet) – via Twitter. ^ Pearce, Matt (August 19, 2017). "Tweet from the account of Charlottesville rally organizer insults slain protester Heather Heyer". Los Angeles Times. Retrieved August 1, 2018. ^ Gallop, J. D.; Denemark, Malcolm (August 16, 2017). "'People need to stop hating,' father of Charlottesville victim Heather Heyer says". USA Today. Retrieved August 1, 2018. ^ Jenkins, Aric (April 16, 2018). "A Charlottesville Photographer Took His Tragic, Pulitzer Prize-Winning Shot on His Last Day. Now He Works for a Brewery". Time. Retrieved July 11, 2018. ^ Cavallaro, Gabe (August 13, 2017). "Photo shows fatal attack on pedestrians with car". The News Leader. Retrieved August 11, 2018. ^ Dang, Sheila (August 15, 2017). "Crowdfunding sites refuse to raise money for white nationalists". The Independent. Retrieved July 9, 2018. ^ Newton, Creede (December 7, 2017). "Charlottesville: Where's the $200,000 the DSA raised?". Al Jazeera. Retrieved August 3, 2018. Clarification Dec. 7, 2017: This article has been amended to make clear the National Compassion Fund controls and is responsible for the disbursement of funds, after concerns were raised by the DSA. ^ a b Alcindor, Yamiche (August 26, 2017). "Foundation Started by Charlottesville Victim's Mother Promotes Social Justice". The New York Times. Retrieved July 9, 2018. ^ a b "Charlottesville victim Heather Heyer's mother to speak at street dedication". The Associated Press. December 20, 2017. Retrieved July 31, 2018. ^ Berg, Lauren (August 15, 2017). "$3M lawsuit filed against Kessler, Fields and others after fatal crash". The Daily Progress. Retrieved August 1, 2018. ^ Shugerman, Emily (September 7, 2017). "A New York politician is campaigning to rename Trump park after Heather Heyer". The Independent. Retrieved July 11, 2018. ^ La Gorce, Tammy (May 16, 2018). "Months After a Brutal Day in Charlottesville, a Tender Wedding". The New York Times. Retrieved July 11, 2018. ^ Bowerman, Mary (May 18, 2018). "Couple who survived Charlottesville attack get married in service dedicated to slain friend". USA Today. Retrieved July 11, 2018. ^ Park, Andrea (May 16, 2018). "Spike Lee slams Trump at Cannes, talks about using Heather Heyer's death scene in new film". CBS News. Retrieved July 11, 2018. Wikimedia Commons has media related to Category:Heather Heyer memorials. Wikimedia Commons has media related to Category:2017 Charlottesville Challenger crash. Kelly, Ryan M. "It Was Pure Reflex" – An article about the photograph. "i missed it." – A blog post about Fields written by an ex-schoolmate who barely knew him.